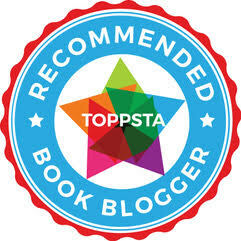 The Strolling Mum BlogJack - The new EcoEgg - "It really works, my love!" Trust me my love, it really works! In a bit of a cross-blog BlogJack thing, my lovely other half The Strolling Mum is taking over the well-worn pages of ReadItDaddy for a review of the magical EcoEgg which was kindly sent to us by the company. So take it away, Ali! 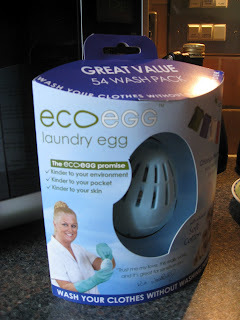 We got to review the Ecoegg earlier this year, we liked it so much that we use it for most of our laundry now and must have saved ourselves quite a bit on washing powder and fabric softener. 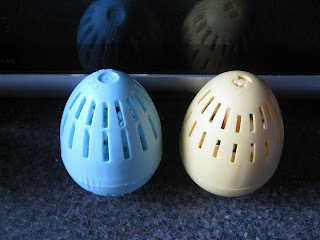 So when we were asked to review the new Ecoegg, with a hit of soft cotton, we were very excited! The new Ecoegg is a lot easier to fill with the pellets, the old one was a bit of an art form and very frustrating. The new one has larger slits and also a new closing mechanism that doesn't require you to hunt around for a coin to lock it. So clean, so white, so buy one! I was amazed when I got the mats out the machine, on a 40c wash they came out clean, all stains gone and that was with no added stain remover. As you can see from the photo, the items on the line look sparkling white and clean. 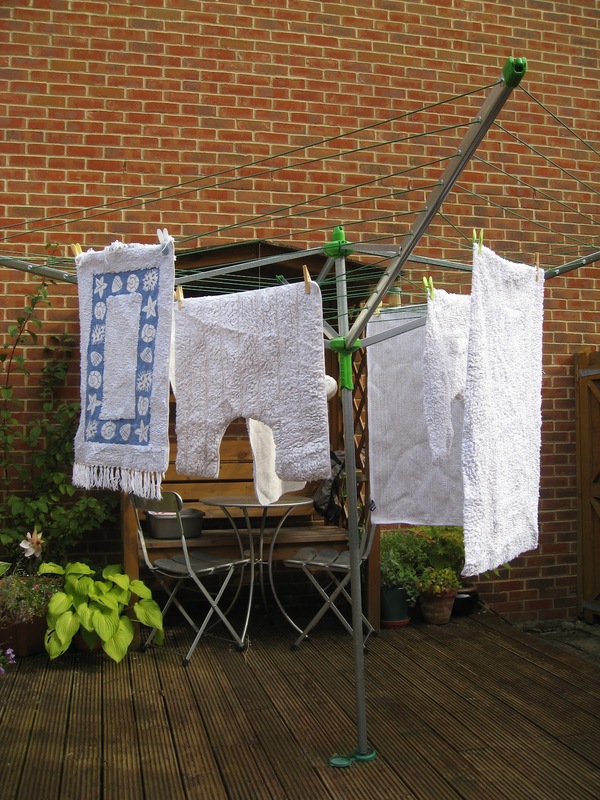 When using the ecoegg sometimes a bit of stain remover is needed in the wash, this is actually stated on the Ecoegg website and from previous experience we knew it might be needed so I was definitely pleased with how it handled the mats without the need for extra work. The "hint of soft cotton"? Yes it did have a very subtle fragrance to it. I didn't add any fabric softener to this wash and everything came out smelling clean and was soft. The new Ecoegg comes with a handy little egg-shaped sheet to tick off how many washes your egg has done. The box says 54 washes. From the last few months experience, how fast it runs down depends on the wash cycle and how much water the cycle uses. Obviously the longer the wash and more water it uses the quicker they run down. I'm saving on washing powder and fabric softener as I only need a little now if I want that "just washed" smell. I just use washing powder now and again when whites start to dull a little. So much easier to fill than the old design. Bonus! A big plus to the Ecoegg is its suitability for the most sensitive skin. Charlotte has never suffered from a rash like she has from some biological washing powders and this is definitely a big selling point for the item. 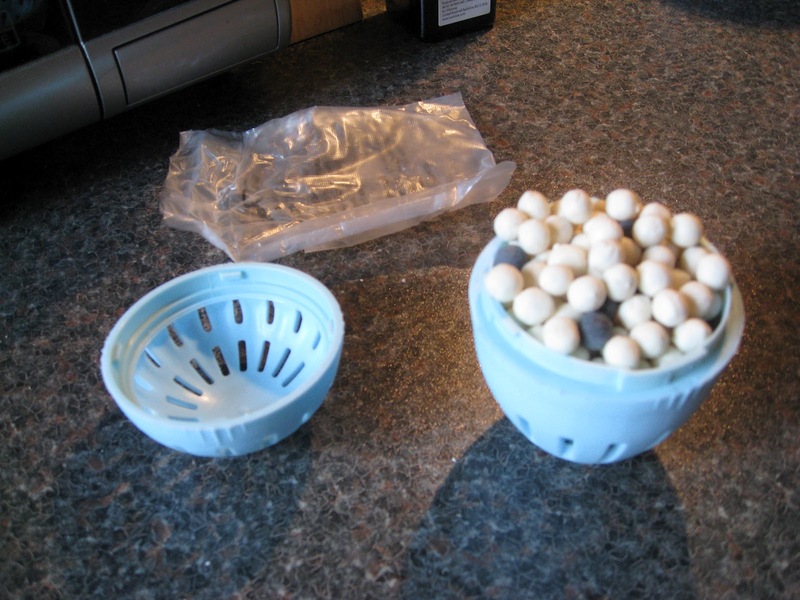 We've read reports of the old style Ecoeggs breaking or coming apart in the wash. We have not had this problem in many months of use. So far I've used the new egg on 2 washes and it hasn't come apart so make sure you follow the instructions in the pack closely. I have always ensured the Ecoegg is firmly closed before putting it into the wash each time. The only drawback with the device is that it really needs some sort of stand or some way of storing it between washes (you can't really put it back in the box, otherwise the box would get soggy - and of course being egg-shaped it won't stand on the draining board very easily). A small niggle about a superb product. If Kim Woodburn says it's brilliant, my love, then you really wouldn't argue with her would you?